Hip-hop star Kanye West alienated millions of fans last week when he openly declared President Donald Trump "my brother" and shared a photo of an autographed "Make America Great Again" hat. In the middle of a much larger tweetstorm, the rapper's pro-Trump musings fit oddly into a narrative about independent thinking and raw honesty. West is no stranger to controversy — musically and politically — but this time, he seemed to outdo himself. Taking a page from West's own book, The Roots drummer and D.J. Questlove showed his disapproval of those unexpected tweets. The shirt is an obvious reference to West's infamous post-Hurricane Katrina comment that former President George W. Bush "doesn't care about black people." 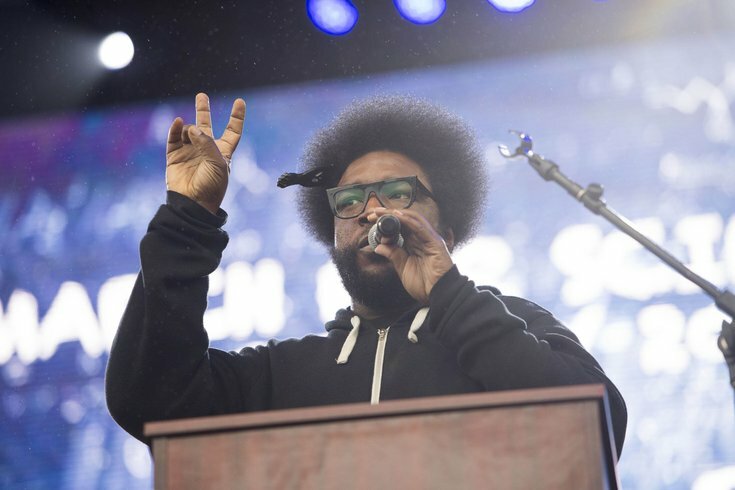 Questlove, who has been outspoken against racial injustice in the U.S., had the new shirt designed with the same look as West's merchandise from "The Life of Pablo" tour. By the looks of it, none of the criticism West is receiving is getting through to him. In a Tuesday appearance in the TMZ studio, West made matters infinitely worse when he stated his belief that 400 years of black slavery "sounds like a choice." Two new Kanye albums are expected to drop in the coming months. It's not clear whether they'll be infused with the beliefs he's lately espoused. If this is supposed to be reckless performance art, Questlove has Kanye pegged.